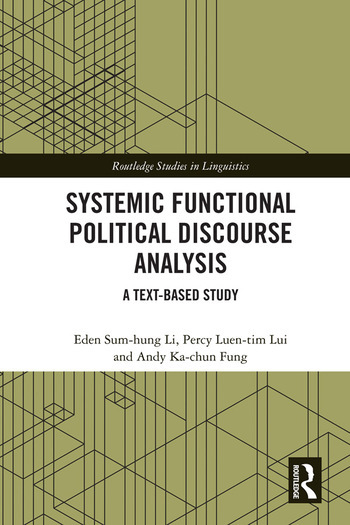 Systemic Functional Political Discourse Analysis: A Text-based Study is the first book which takes a comprehensive systemic functional perspective on political discourse to provide a complete, integrated, exhaustive, systemic and functional description and analysis. Based on the political discourses of the Umbrella Movement – the largest public protest in the history of Hong Kong, which occupies a unique political situation in the world: a post-colonial society like many other Asian societies and yet unlike the others, it is a Special Administrative Region of China. Though it enjoys a high degree of autonomy under the principle of ‘One Country, Two systems’, it is still confined to being part of the ‘One Country.’ The book demonstrates how a Systemic Functional approach can provide a comprehensive, thorough, and insightful analysis of the political discourse from four co-related and complementary approaches: contextual, discourse semantic, lexicogrammatical and historical. Apart from a thorough discussion of various Systemic Functional conceptions, it provides examples of various analyses from a SF perspective, including contextual parameters, registerial analysis, semantic discourse analysis, appraisal analysis, and discusses important issues in political discourse, including negotiation of self-identity, association of language, power and institutional role, and expression of ‘evidentiality’ and ‘subjectivity’. It is written not only for those who are interested in Hong Kong politics in general and political discourse in Hong Kong in particular, but also for those who work on political discourse analysis, and those who apply SFL to various other discourses such as mass media discourse, medical discourse, teaching discourse, etc. Last but not least, this book is also intended to provide a theoretical framework in discourse analysis from the Systemic Functional perspective for those who work in Cantonese and in other languages. Eden Sum-hung Li is Assistant Professor in Linguistics and Programme Leader in the School of Arts and Social Sciences at the Open University of Hong Kong. He has taught at Macquarie University and the University of Hong Kong. He is the author of A Systemic Functional Grammar of Chinese and Language, Society and Culture in Hong Kong, the first author of English Today: Forms, Functions and Uses and the co-author of Analysing, and Applying English Grammar. Apart from these four books, Li has also published more than 60 book chapters, international journal articles, proceedings, and conference papers. Percy Luen-tim Lui is Assistant Professor in Public Administration and Programme Leader in the School of Arts and Social Sciences at the Open University of Hong Kong. He is the co-editor of Contemporary Hong Kong Politics: Governance in the Post-1997 Era and Contemporary Hong Kong Governance and Politics. Apart from these two edited books, Lui has also published several book chapters and international journal articles. Andy Fung has a PhD in Linguistics. As a member of the PolySystemic Research Group, he has situated himself mostly within Systemic Functional Linguistics (SFL), and specialised in functional semantics in the area of political discourse, healthcare communication and multimodal analysis. He has various research collaborations with scholars around the world, engaging in number of international conference presentations, and contributing book chapters on semantic networks.